Gafchromic Film, EBT3, 8x10 Inch - Radiation Products Design, Inc.
Gafchromic® Film EBT3, 8" x 10"
GAFCHROMIC® EBT3 dosimetry film has been designed specifically as a time-and-cost-saving tool that addresses the needs of medical physicists and dosimetrists working in radiotherapy environments. It is targeted toward applications in external beam radiotherapy and supports the processor-less environment of the modern hospital. GAFCHROMIC® EBT3 are made by laminating an active layer between two polyester layers. The polyester surface makes an exceptionally robust product and allows water immersion. 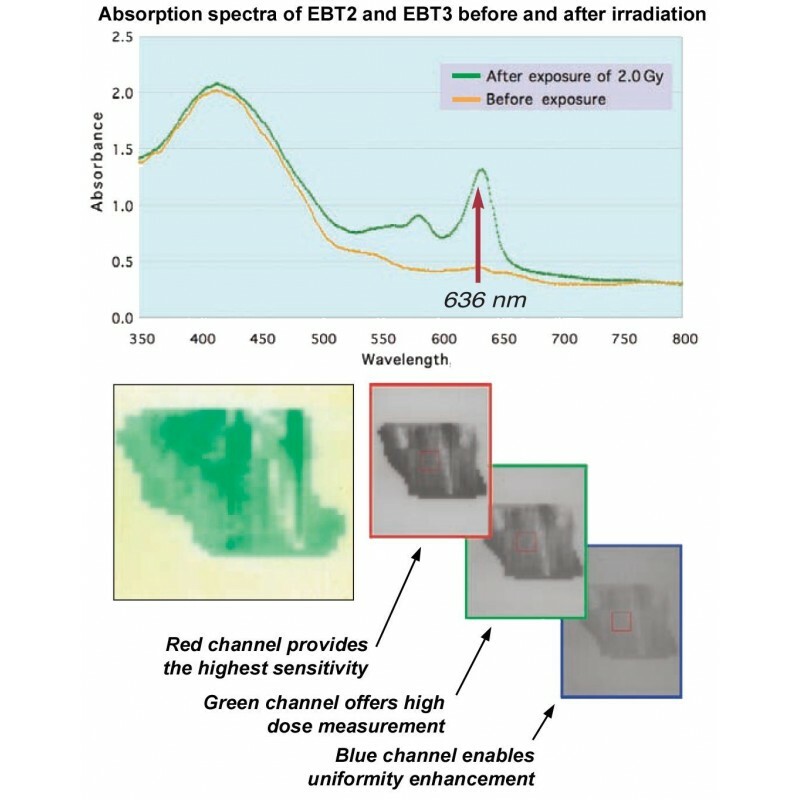 Since the absorbance spectra of the active component of GAFCHROMIC® EBT3 peaks at 636 nm, the sensitivity is maximized by measurement with red light. Transmission densitometers that are commonly used to measure visual density with conventional films are suitable for use with EBT3 film. Better results can be obtained from the red color channel with a color densitometer. Further improvement of results can be obtained by using a narrow band pass filter with central wavelength at about 636 nm and 10 nm bandwidth while making measurements. Approximate thicknesses, actual values may vary slightly. GAFCHROMIC® EBT3 dosimetry film can also be read with a film scanner or digitizer. As with densitometers, the response of the film can be enhanced if the spectral response of the scanner is matched to the absorbance of the film. Many high-quality scanners are available to digitize colored films. The Epson® 10000XL PHOTO flatbed color scanner, which is designed to digitize film 8" x 10" in size, and even as large as 12" x 16" in size, is recommended to scan EBT3 film. 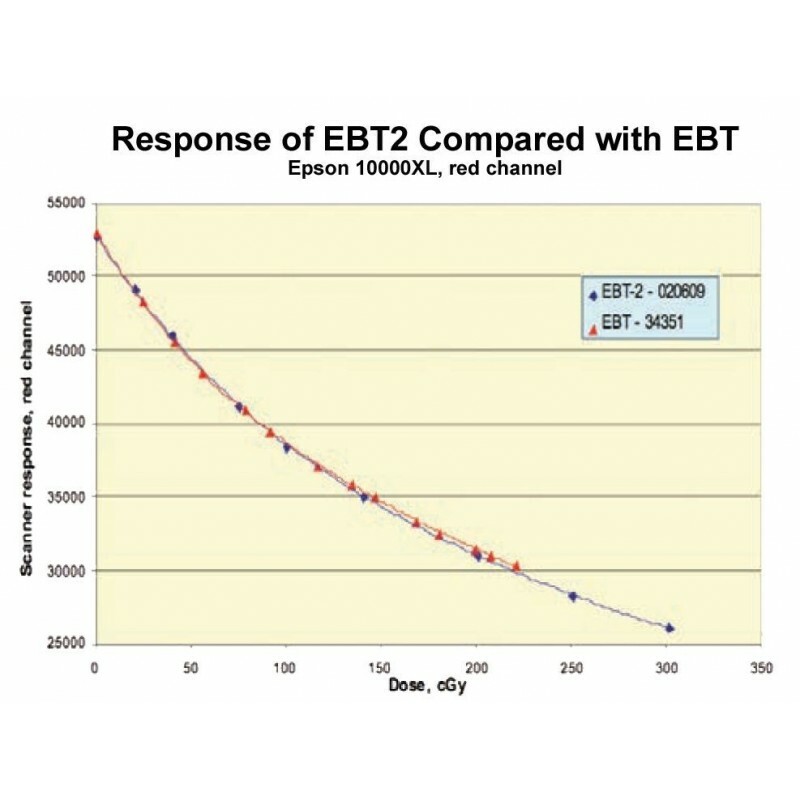 For doses up to 8 Gy, the Epson® 10000XL provides the most sensitive response for EBT3 film from the red color channel. The green channel can be used to measure doses between 8 Gy and > 40Gy for EBT3. The blue channel provides a response signal for automatic film uniformity enhancement via a special marker dye in the active layer of EBT3 film. The recommended scan orientation for the film is landscape. 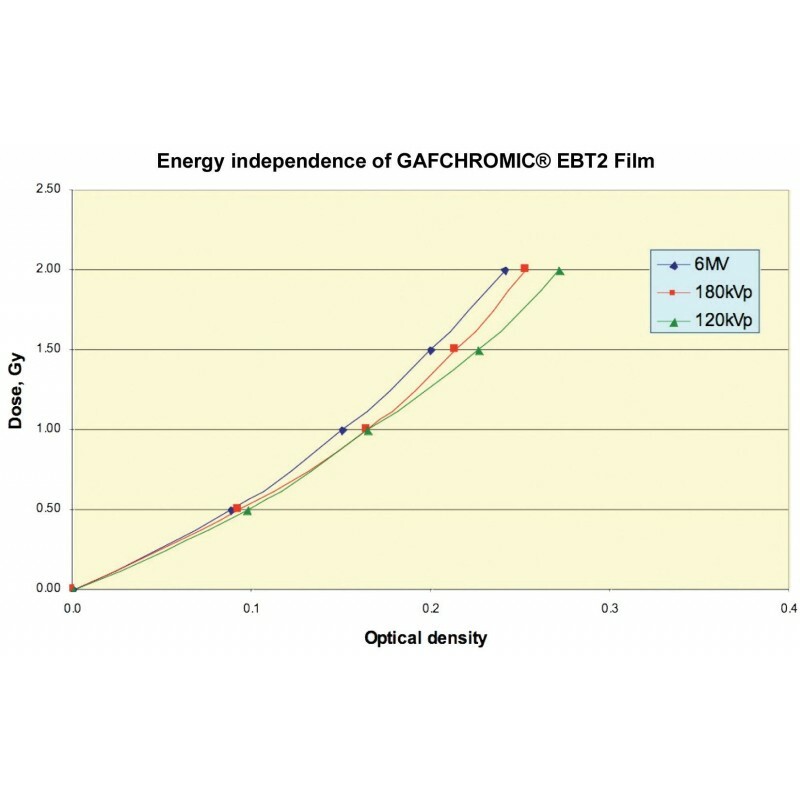 NOTE: The response of GAFCHROMIC® EBT3 dosimetry film is dependent upon factors specific to the facility such as the energy spectrum of the radiation source, the characteristics of the densitometer, film scanner or other means of measurement and the elapsed time between exposure and measurement etc. Therefore, the user should determine the dose-density response under the conditions pertaining to the user's facility and measurement protocol. 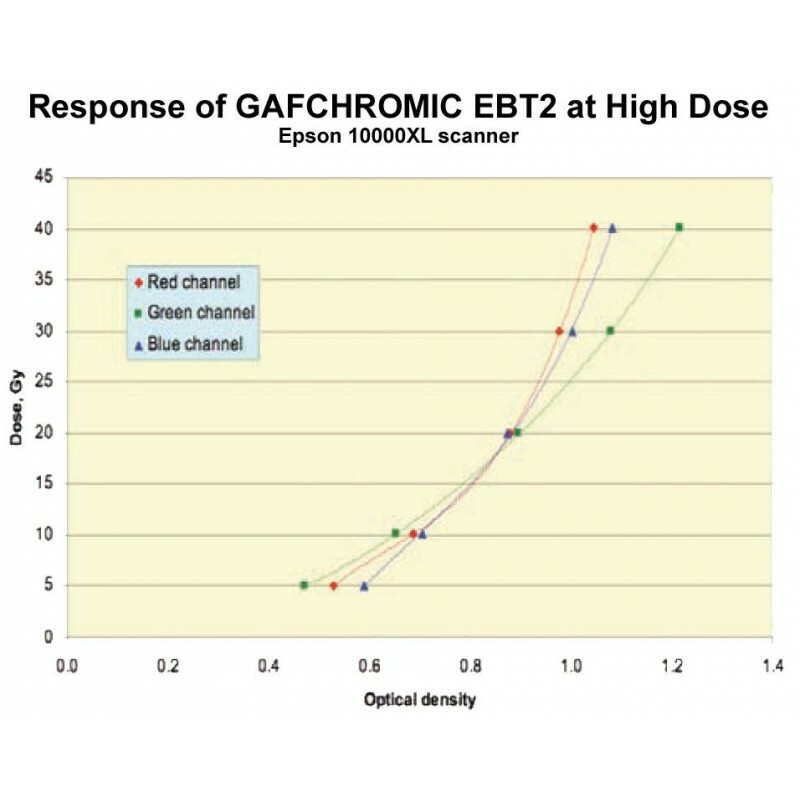 Since the absolute response of GAFCHROMIC® EBT3 dosimetry film may vary from lot to lot, the user should re-measure response when changing to a new lot number. EBT2 and EBT3 film. An efficient protocol for radiochromic film dosimetry combining calibration and measurement in a single scan.